More Information on the 33 Liter Unit. More Information on the 85 Gallon Unit. Our Essential Oil Distiller is a true vertical steam distillation unit made from scientific-grade borosilicate glass, specifically designed for easy steam extraction of essential oils from plant materials by the non-chemist at home, resulting in the highest purity essential oils. Unlike other steam distillation units on the market, ours' offers true "dry steam" distillation in an all glass (Pyrex) system. Coupled together with ground glass joints, there are no hoses or rubber stoppers in contact with your product because it's all glass! The "open-to-atmosphere" design means that steam pressure can never build up in the system, making the system much safer to operate and insuring that the distillation process will take place at exactly 100 degrees C (at sea level) and not a degree higher! 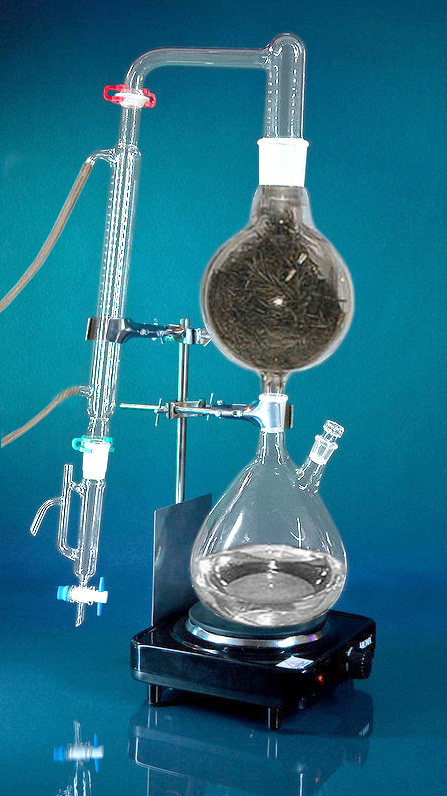 The simple design addresses a number of problems associated with competitor's stills, Because of it's "vertical" design, the biomass flask stays dry, none of the "boiling water" is wastefully condensed and trapped in the biomass flask, and because it uses separate flasks for boiling and biomass, there's further insurance that overheating or possibly burning your plant material will never happen. Our uniquely designed filter traps up to 20mL of either "heavier than water" oils or "lighter than water" oils while automatically draining away the excess condensed water (the "Hydrosol", that can be kept for many purposes) thus allowing you to start the distillation and let it proceed on it's own without constant need of attention. 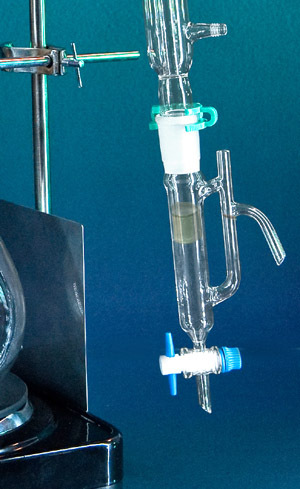 When the distillation is complete, the receiver then doubles as a tapered separatory funnel, allowing you to easily separate your prized oil from the remaining water. 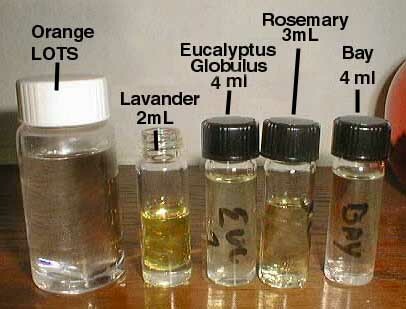 The production of a very small amount of essential oil requires the distillation of a lot of water. 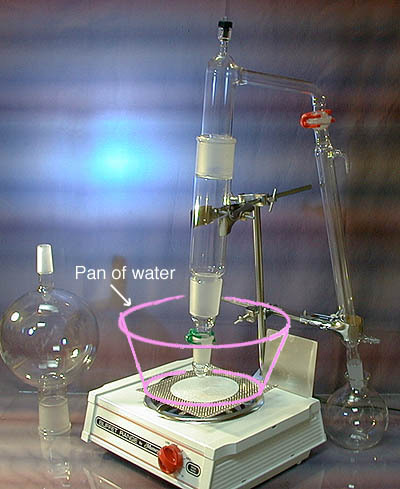 Other essential oil distilling setups require that you constantly watch the vessel that catches the condenser drips because the excess water must be constantly drained off as it is condensed. 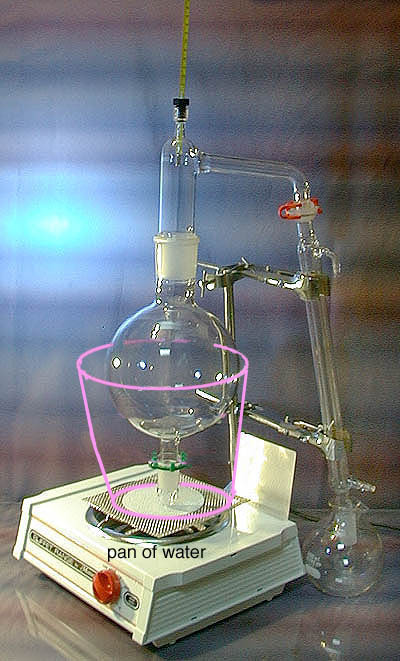 When the distillation is complete, the contents of the "catch vessel" must then be transferred to a separatory funnel in order to separate the water and oil layers. This is cause for much time and labor unnecessarily spent. We have designed a unique receiver that captures both "lighter-than-water", and "heavier-than-water" oils and continuously and automatically drains off any water ("Hydrosol") that's being condensed!! You can simply send the excess water to the drain and toss it, or it can be kept as "Hydrosol" and used. Water drips in to the receiver, and as it fills, excess water begins to be removed from the middle of the vessel via the side-pipe. The vent on the side pipe is to prevent siphoning action. As your oil accumulates, it either floats on top or sinks to the bottom of the receiver, while water from the center of the vessel is constantly drained off. The receiver can hold approximately 20mL of either weight oil. When the distillation is complete, the Teflon valve is carefully opened and the water and oil is then drained and separated into respective vials. Because it is all automatic, you can start the distillation and walk away for hours at a time, with confidence that everything is going to plan. 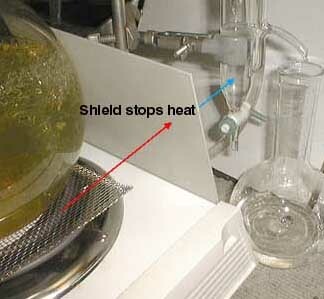 The backplate is provided as a heat-shield to prevent line-of-sight infra-red heat from the hotplate from heating up the customer's receiver flask as the distillation process continues. Screw the back plate on to the rear of the hotplate using the two #8 screws provided. Place support rod into the clamp built into the rear of the hotplate by squeezing the top and bottom of the clamp together and inserting the rod thru the holes. Now assemble the two clamps to the support rod and placing them both high up on the rod. Leave the screws snug but not tight. Place the square wire mesh pad centered on the stove heater-coils, ceramic side up. Ground glass joints will freeze together if not properly lubricated! Three small packets of Silicone joint grease compound have been provided. Before assembling any of the ground glass joints, it is recommended that you first put a tiny dab of grease on the male end and wipe it into a line using a toothpick or your finger. Then assemble the joint, twist it gently into it's socket, rotating it at least one rotation to spread the grease around. If you have the right amount, the joint connection will rotate smoothly and become slightly "clear" to the eye. 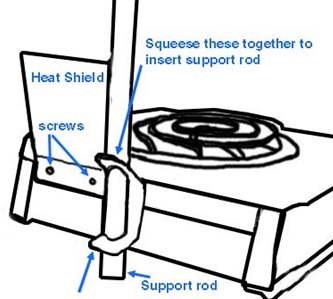 Too much grease- it will spin with very little friction and you'll have grease mushing out everywhere; too little and the joint will not become "clear" as you press on it and rotate it, and it will feel sticky. It actually takes very little grease to do the job. The amount in the vial may seem small, but it should last at least a month or two with daily use of the still. Start by filling the boiling flask about 2/3 full with water (a little more is OK but no more than 2/3 maximum). Since you're distilling the water, tap water is OK, but you may want to use distilled or purified water so you don't get things like chlorine vapors coming into your biomass . There is a small vial of boiling chips provided. Drop 4 or 5 of them into the water (IMPORTANT to do this- these chips promote even, controlled boiling). Grease the biomass flask joints and assemble the biomass flask to the boiling flask (pre-loaded with plant material of course). Place the biomass flask on top of the boiling flask, center the flasks on the burner, and secure the flasks using the upper clamp, attached to the top neck of the biomass flask. NOW lightly grease both ends of the steam transfer tube and drop it into the top of the biomass flask. 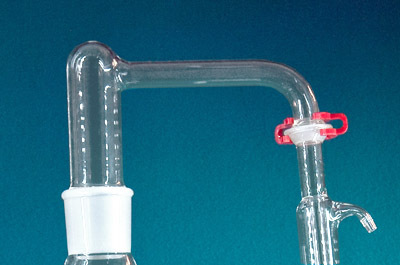 Clip the condenser to the transfer tube using the provided red plastic "Keck" clamp. Last, FILL the receiver (preload it) with distilled water- close the stopcock and pour in enough water to make it come out the drain tube. As the distillation process begins and receiver fills up with condensed water, the water's level will eventually rise above the bottom level of the outlet pipe. You will likely have a small quantity of essential oil floating on the surface in the receiver by then, and you'll notice that a small "plug" of it gets caught in the receiver's outlet pipe. This oil will be lost into the hydrosol collection flask and will not be easy to recover. If you preload the receiver with water before starting the distillation, this will not happen. SO preload the receiver with water, and now using the green keck clamp, assemble it to the condenser. You will now use the second clamp provided to hold it in place to the stand/support rod. If you've done it correctly it will look like the photos. The backplate should stand between the heater coils and the receiver, so that heat radiating from the heater does not have a "line if sight" path to the receiver. (this keeps your distilled oil cool). 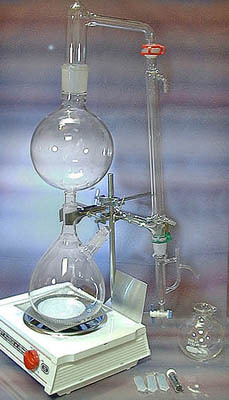 Place your own catch flask under the receivers' drip tip to catch the first hydrosol that comes off during distillation. It's best to position it so the drips hit the rim of the container, so they don't splash as they drip into the water. OR if you are not interested in keeping the hydrosol, you can place the whole still on the edge of your sink so the hydrosol simply drips into the drain and goes away. The best thing you can do is to use a bucket of ice water and a small "fountain" pump to pump chilled water through the condenser. Water goes IN THE BOTTOM and OUT THE TOP of the condenser. Tap water will work just fine, but the experts say chilled water is better, and it conserves this precious resource. In any case, it only needs to be a trickle, but IT MUST ALWAYS BE MOVING. Once the distillation gets underway, you will be able to tell if your flow is enough by feeling the temperature of the water coming out...if it is cold to luke warm, your flow is enough. If it's warm or hot, turn up the flow. Be sure to plug the hoses on to the glass hosebibs snugly... a hose popping off in the middle of a distillation is a good way to make a real mess! The hose may seem difficult to get on to the condenser fittings- if so, simply warm the end of the hose over a lighter or candle flame (don't burn it!) and it will then stretch easily and slip on. (You may have to cut it off with a razor blade later.) Basically, that is it. Turn on the condenser water, Make sure the stopcock on the receiver is CLOSED, Turn the hotplate on FULL HIGH and let it rip! As the water heats up and starts to boil, you'll see steam starting to finally come out the top as the biomass flask heats up. This takes about half an hour. (The distiller head is shown at left below.) Eventually you'll finally see that first drip make it's way down the condenser and into the receiver (shown at center and right below). Then you'll see a layer of oil starting to form -- there it is!! You will likely find that with many plants, the bulk of the oil comes off in the first 10-20 minutes, and the remainder takes 2-4 hours. As the process continues, the oil layer will grow, and when it's all done, you simply turn everything off and let it cool down, remove the receiver, carefully drain off all the water you can by slowly opening the stopcock, and when the water's gone and the oil layer has just barely hit the bottom, quickly close the stopcock. Then clamp the receiver to the support rod and let it hang there for 10 minutes or so, to allow any oil stuck on the sides to make it's way down and join the big puddle. Then finally, open the stopcock and drain the oil into a vial. I usually just swirl a lot of soapy water around in the parts, and use a bristle brush to clean everything. It's all pyrex, so it can also be put in a dishwasher. It's a good idea to first wipe as much of the joint grease out as you can with a paper towel or kleenex. Otherwise just treat it as any other glass item and wash it as you will. BE CAREFUL to not clunk the glass against the sink... those plastic liners are nice for safety as most glassware is broken during cleaning!! If the flasks bump into a hard object like a tile counter or porclean sink, they may develop little tiny "star" cracks. These are dangerous- they can be repaired, but if left un-noticed, they can easily cause a flask to crack or break apart at the most inconvenient time, like when it's full of boiling water. BE CAREFUL WITH THE GLASSWARE!! I've found that using a chopstick or a pair of medical Forceps is helpful in getting plant matter and stems out of the biomass flask. Shaking it in a plastic trashcan also works well to remove finer plant material. Guck in the boiling flask that builds up from the mineral deposits of your tap water can quickly be removed with a swirl of muriatic acid (pool acid) or dilute hydrochloric acid. A good soak with Lime-away will probably works just as well. BE CAREFUL with these chemicals, they are dangerous. I usually do not remove the water hoses from the condenser- I've found that for the most part, simply pouring a little soapy water inside the center tube, plugging the ends with my fingers, and giving it a good shake is usually all that's necessary to clean the condenser. It's a lot easier to just leave the hoses on for storage. compatible with the 2 and 5 liter systems because of the larger joint sizes. This kit, $75, enables you to set 2 and 5 liter distillers up for many different kinds of operations ranging from hydrodistillation to solvent recovery and tincture concentration. The ground glass thermometer adapter well is only available on the distiller head, if you order the Adapter Kit at the time you place your original order for the distiller. It is not present on the standard model. Note: this adapter kit is not compatible with the 10 liter system due to the difference in joint sizes. An adapter kit can be special ordered for the 10 liter kit for $120. 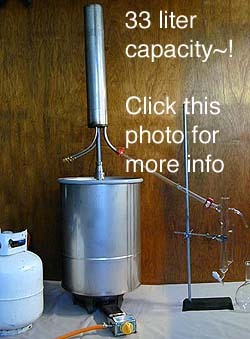 If you wish to do a "Hydrodistillation" instead of a steam distillation (the biomass is simply stuck right in there with the boiling water instead of in a separate flask), use the long hydrodistillation adapter from the option kit in place of the biomass flask, and then set the still up the same as you would for steam distillation. You might want to wrap a towel around the tube as an insulating jacket, to help the steam to go all the way up to the top without condensing. Mix your biomass in with the water in the boiling flask and proceed as normal. The collector flask shown in these photos is supplied by the customer. You may use any convenient flask, bottle, or beaker for this purpose. 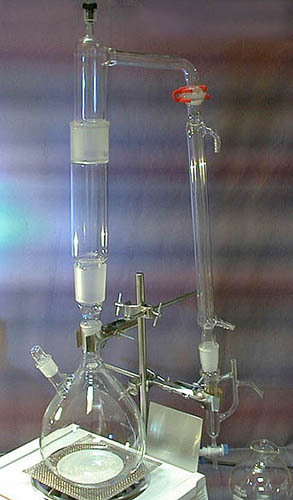 More traditional laboratory distillations, such as solvent recovery, sometimes require the use of a thermometer in the process, and a slightly different setup using other of the optional kit's components (see Adapter Kit). In this case, put the solvent to be recovered into the bio flask which has been capped with the little cap from the kit, and put the thermometer from the kit into the top of the stillhead with the thermometer adapter option. NOT SHOWN in the photo -- you then need to submerge the lower half of the bioflask in a pot of water that you then heat with the hotplate, and this will then boil your solvent and cause it to distill and purify. 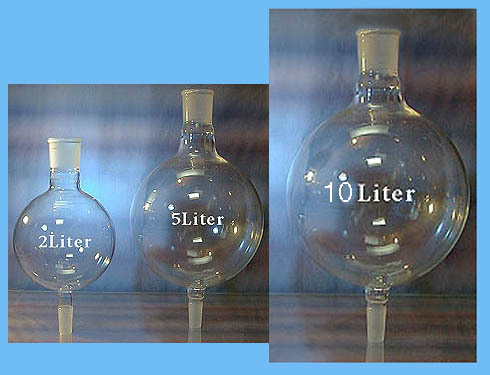 The purified solvent can be recovered in a beaker, bottle, or flask. The thermometer will allow you to monitor the progress of the distillation as it runs. Turn the heat on and as things get going, turn it down until the rate of drip out the condenser is about a drip or two per second, which is the distillation rate at which you typically get the best purity. Watch the thermometer as the distillate starts coming over, you'll see the thermometer shoot up to it's published boiling temperature. As long as the temperature stays there, you're collecting what you want. When all of what you are collecting is gone from the boiling mixture, the temperature will often take a dip, distillation will stop for a moment as the temperature of the boiling pot increases, and then it will all resume at a higher temperature. This signals that it's time to stop at this point, or you'll now be diluting your prized catch with stuff you don't want! ALWAYS use boiling chips to even out the boiling action.. Using the adapter tube and cap, when set up as shown here you can use the set to concentrate tinctures by driving out the solvents and recovering them in the 500ml flask. The concentrated tincture will stay in the adapter tube and cap. As in the solvent recoverys setup above, you then need to submerge the lower half of the adapter tube in a pot of water that you then heat with the hotplate. 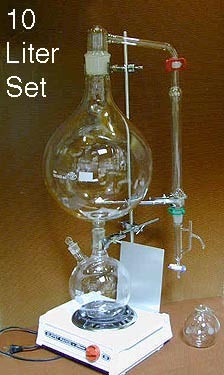 The receiver is not used in these distillations. ALWAYS USE BOILING CHIPS in these kinds of distillations. Turn the heat on and as things get going, turn it down until the rate of drip out the condenser is about a drip or two per second. Watch the thermometer as the distillate starts coming over, you'll see the thermometer shoot up to it's published boiling temperature. As long as the temperature stays there, you're collecting what you want. When all of what you are collecting is gone from the boiling brew, the temperature will often take a dip, distillation will stop for a moment as the temperature of the boiling pot increases, and then it will all resume at a higher temperature. This signals that it's time to stop at this point, or you'll now be diluting your prized catch with stuff you don't want! Lots of water always condenses in the biomass flask- it's unavoidable, and it accumulates and eventually covers up a lot of the plant material I'm trying to distill. In the EOV2000, that water simply drips back down into the boiling flask to be reused, instead of accumulating in the biomass flask being wasted and causing plant material to become flooded and no longer in contact with steam. The EOV2000 vertical design insures that the biomass stays dry. Because any water condensed in the EOV's biomass flask automatically drains back down into the boiling flask, the EOV2000 can go for three hours or more without having to add new water to the boiling pot. There's a ground glass stopper in the side of the boiling flask to make water addition very easy, in case you need to. Our vertical design is very compact and doesn't take up the whole kitchen sink!! Uncondensed steam occasionally comes out of the end of the condenser...isn't this potentially loosing precious oil? YES! 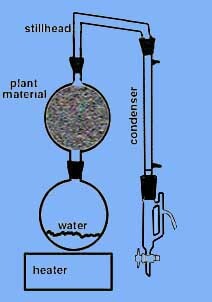 Inefficient condenser arrangements loose oil! Systems that put the biomass right in the boiling water can heat it above boiling water temperature- 100c, and i don't like my biomass getting any hotter than necessary. EOV2000 is an "opened" system, and allows only steam at atmospheric pressure to touch the biomass, meaning that pressure and/or temperature cannot build up, thus eliminating the possibility of excess temperatures ruining your product. The biomass can never get hotter than 100 degrees C under any situation. * Still Head, 45/50 with male spherical condenser joint. Basically everything you need to open the box, harvest your herb garden, and make Essential Oils!